Life cycle: This insect produces one generation each year and will overwinter as an egg. Physical Description: This 2-inch long caterpillar is pale blue or black with a blue head and white marks running down the middle of its back. The adult moth is yellow to brown with darker markings and a wingspan of about 1 inch. The eggs are laid in strips around twigs of the host plants. Cocoons are spun and attached to the host plants. This particular tent caterpillar does not form tents. 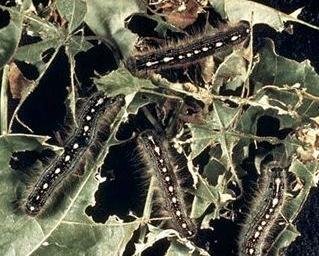 Similar insects include the Eastern Tent Caterpillar. Feeding characteristics: This pest attacks apple, cherry, peach, pear, plum, and quince plants by chewing the leaves. Controls: handpicking is usually enough control, but if damage is intolerable, spray with Bacillus thuringiensis.